I got a new bike earlier this summer (a Kona Dew Deluxe) and it’s a sort of cross between a mountain bike and a road bike. It uses the narrow 700 cm road tires and so I’m learning to deal with Presta valves whenever I need to inflate the tires. That requires putting an adapter on the valve stem since my air compressor is set up for much more common Schrader valves. One of the annoyances of bicycling on the Front Range of Colorado is the abundance of thorns called ‘goat heads‘. They will easily puncture bicycle tires. I learned this many years ago when I purchased my first bike in Colorado only to get two flats tires on the same day I took it for its first spin. When I returned to the bike shop, they asked if I had put TR tubes in it yet. TR tubes? “What are those and why didn’t you let me know about this when I bought the bike?” I was new to Colorado and never heard of TR tubes. “TR” stands for thorn resistant and their outside wall is about 4 times thicker than that of standard tubes and so the goat heads generally cannot penetrate in far into the tube wall enough to puncture it. After installing these tubes, I didn’t have any more problems with flat tires from the goat heads on my mountain bike. However, with my new bike, despite putting TR tubes in it before leaving the bike shop, I’ve had several flats from goat heads. I guess it’s because the rubber on both the tire and the tube is thinner to begin with than standard 26″ mountain bike tires. So I needed another plan. 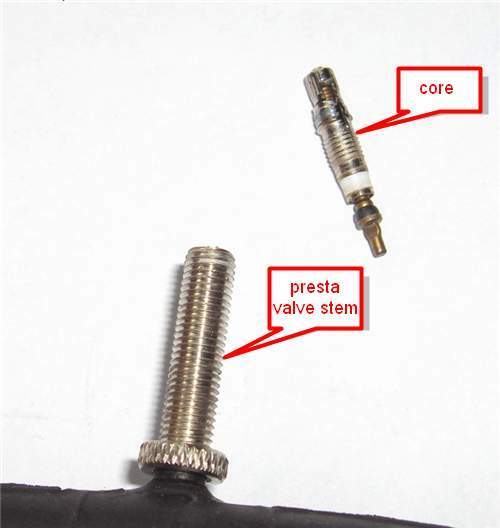 I see a lot of Slime tube sealant for sale these days in bike shops, and I was wondering if there would be a way to get it into tubes that had these newfangled Presta valves since the cores didn’t appear to be removable. I looked on the Internet and found several websites that talked about a method of using cutters to clip off the last few threads on the part that holds on the nut you need to loosen to put air in Presta valves. This causes the threaded part to fall into the tube which allows enough room to put the Slime in the tire. Then you have to push the threaded part back up into the stem and secure it with the nut, which now has no locking thread to keep you from unscrewing it all the way. I was hoping that I would not have to do that. I found that I was in luck because my tubes had Presta valves that allowed me to remove their cores. 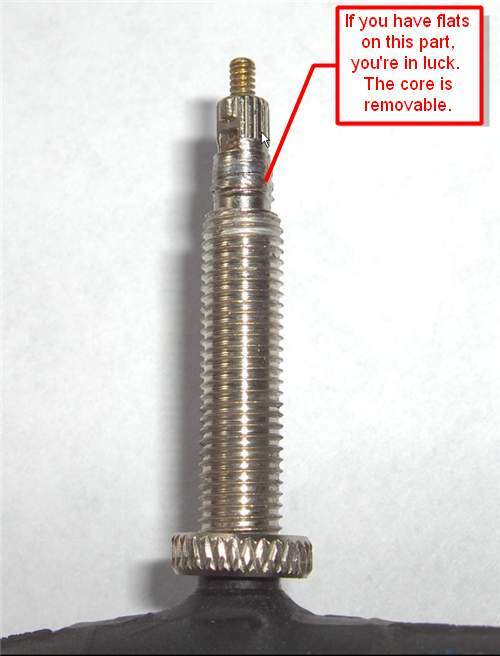 If you look at the part of the valve that has the threads to hold the valve cap on and it has flats on it, then that means the core can be unscrewed. This Presta valve above has flats on the threaded part that holds on the cap which means the core can be unscrewed from the valve stem. In my case, I already had some Slime but my local bike shop guy, Mark at International Bike in Greeley, is a strong proponent of True Goo. He believes that this product is easier than Slime to put in the tire due to its lower viscosity and that it seals better too. If you search on the Internet, you’ll see a lot of people telling you these tube sealants don’t work. I think the reason for this is that it’s still possible to get a flat even with tube sealant, especially if the hole is so big that the sealant comes out so fast it can’t solidify. Also, people are much more likely to post a rant about a product that let them down rather than to take the time to post a positive review. 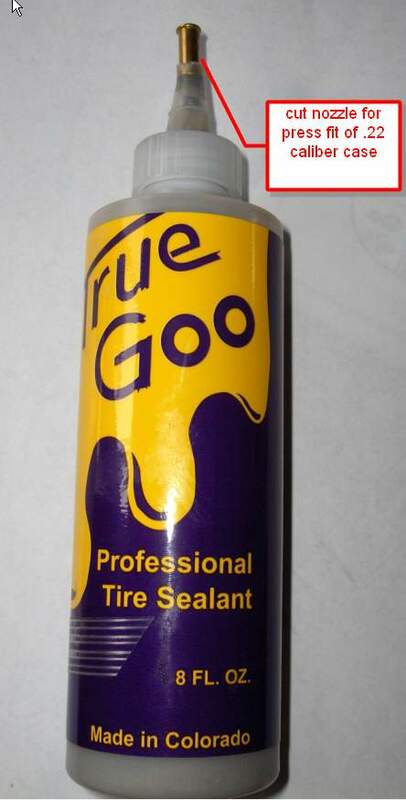 In addition, when tire sealant works, you don’t really have hard evidence to let you know that you would have gotten a flat if you didn’t have the sealant in the tube. So it’s hard to measure tube sealant’s effectiveness. In my case, I had the perfect experiment. My rear tire’s tube was losing nearly all its air every 2 days. It meant that each time I wanted to go for a ride, I needed to put air in the tire. I had debated on whether to patch or replace the tube, but then I realized that it would be a great experiment to see for myself whether tire sealant actually works, especially on slow leaks, which are the kind you generally get from the tiny holes that goat heads put in the tubes. 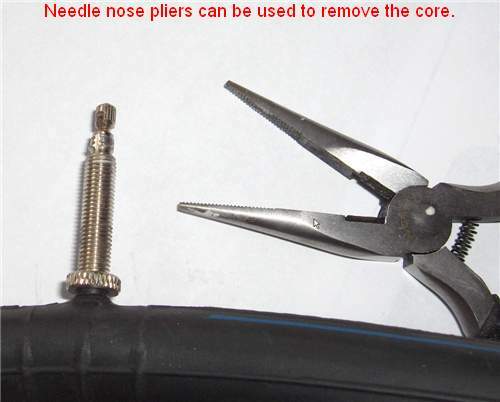 If your Presta valve has a removable core, you can even put the sealant in when the tire is on the bike. Just rotate the valve to the top, insert the nozzle on the valve stem, and rotate it back around to the bottom. Squeeze in about 3 ounces of fluid, rotate back to the top, remove the bottle. Then replace the valve core and fill it with air. I found that my tire that leaked down every 2 days consistently has now held its pressure for several weeks, which leads me to believe that this stuff actually works as advertised. 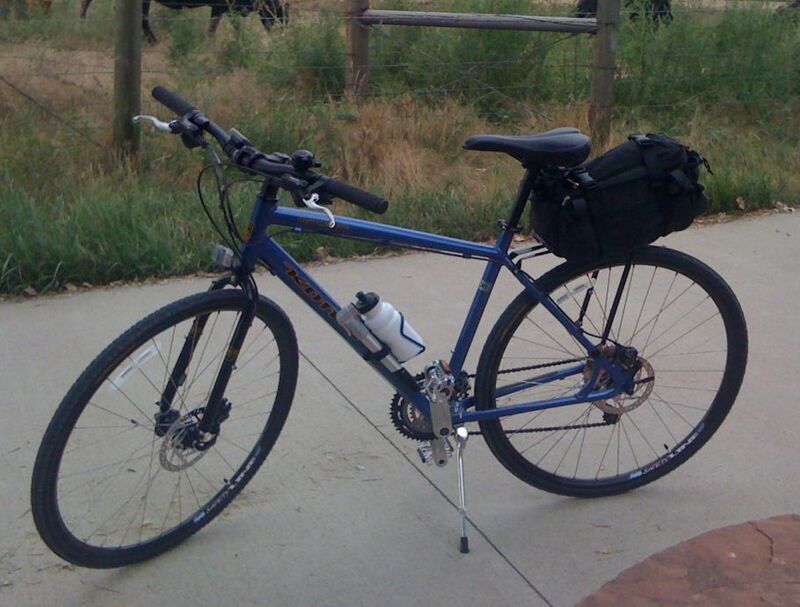 This entry was posted in hobbies, household repair, how to, reviews, technology and tagged biking, repair by Lee Devlin. Bookmark the permalink. 1. Presta valves are not “new-fangled” things. They have been around since the dawn of time, and are normally associated with higher quality, more serious bikes, while Schrader valves are normally used on K-Mart quality bikes. That is because in the past, presta valves were far superior for being able to put air in accurately without loosing all the air when you disconnected the pump head. Back in the day, the only pump heads for Schrader had to be “screwed on” the valve stem, and you would lose half of your air when you took it off. Modern “flip style” pump heads now make Schrader valves more usable, but prestas are still better for high pressure tires. 2. Ideally, you should not use an air compressor to pump up a bicycle tire, because you will not be able to accurately attain the correct pressure. This is because the volume of air in a bike tire is much less than in a car tire, and one little burst of air can pump the tire for 60 psi to 120 psi, and in some cases that might blow the tire off the rim. A mountain bike tire is a little larger in volume, so not quite as susceptible but still you have no control. And if you try to check your air pressure with any type of gauge, chances are you will let out a little bit of air, which could significantly reduce the actual pressure in the tire. The best way is to get yourself a good quality “floor pump” from your local bike shop or on-line. These have built in in-line pressure gauges which accurately measure the pressure as you are putting it in. Get a good one with a good quality head on it, because a lot of them are crap and annoying to use. Best is to take your bike into a shop, ask them for the best pump they’ve got and test it on your bike. Mine cost $100, but a good one can be had fro $40-$50. Also, experiment with your pressure. Some roadies like to put 150 psi, and I think that’s kinda crazy, but depends on your weight and tires. 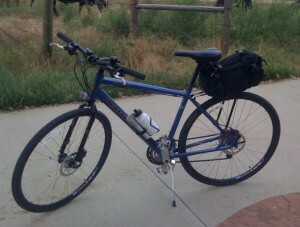 I run about 90 in the front and 100 in the back of my daily use road bike with 23mm wide tires, and sometime use sew-up. Google Sheldon Brown’s page on this subject- his web page is a good resource even today. HAPPY RIDING!!! !